Fishman, Jon M. Kawhi Leonard, 32 pages. NON-FICTION. Lerner, 2018. $25. 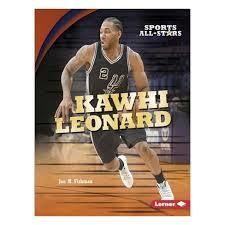 Content: G.
The San Antonio Spurs basketball star Kawhi Leonard is the featured player of this Sports All-Stars book. The book gives a short biography about Leonard as a high school, college and NBA basketball player and why he won the NBA Defensive Player of the Year Award twice. Leonard also has his own brand of clothes and likes to help his community. This book is for sports lovers. Kawhi is very tall and has an extra-long wing span making him really good at what he does. There are great photographs throughout as well as a glossary and stats. As with all sports books, they date quickly, but this book is current up until the 2016-2017 season. EL – OPTIONAL. Reviewer, C. Peterson. Sheinkin, Steve Abigail Adams: Pirate of the Caribbean (TimeTwisters, #2), 150 pages. Illustrated by Neil Swaab. Roaring Brook Press (Macmillan), 2018. $14. Content: G.
Abby and Doc have to go back in history to try and convince Abigail Adams that she is an important historical figure, after Abigail decides she doesn’t want to be known for hanging laundry in the white house. 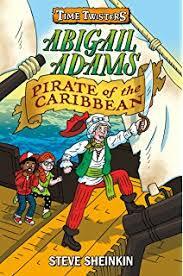 Abigail herself has changed time periods and is a woman pirate, so when Abby and Doc go back to the 1700’s to try and convince Abigail to leave the pirate ship and return to her role as First Lady they are caught up in a pirating lifestyle. When the conditions on the pirate ship get dire, John Adams shows up to rescue his wife and the kids, but it may be too late. As the second book in the Time Twister series, Abby and Doc’s adventures with historical figures continues. The rules for traveling through time are as simple as jumping into an empty box, barrel or laundry basket and then they just magically appear in whichever time period there is a problem. The illustrations are sub-par, (my boys passed them up based on the illustrations), and the story is a bit confusing with so many different time periods and not enough foundation for young readers about who Abigail Adams was. Like in the first book, there is an author’s note at the end that clarifies what really did happen in history and what did not. 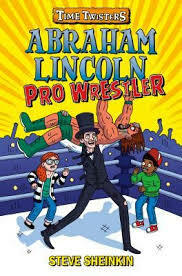 Sheinkin, Steve Abraham Lincoln: Pro Wrestler (Time Twisters,#1), 147 pages. Illustrated by Neil Swaab. Roaring Brook Press (Macmillan), 2018. $14 Content: G.
Abby and Doc are siblings that find history boring. One day while in the library, Abraham Lincoln arrives after time traveling to warn them that if they don’t start to appreciate history, then historical figures are going to stop doing what they are supposed to. Abby and Doc try to convince their classmates to care about history, but their classmates are more interested in the pro wrestler that is coming to their school. When Abe Lincoln finds himself in the middle of the pro wrestling match, Abby and Doc have to convince him to return to his place in history and help the country. This story has a similar feel to the Magic Tree House series, but isn’t as well done. The illustrations aren’t great and the rules for time travel aren’t well established. The occasional true historical facts are so mixed up with the weird story line that it’s hard to decipher what are real Abe Lincoln facts and what isn’t real. This is geared towards 2nd-3rd grade new readers and there is an author’s note at the end clarifying what is real and what is not. 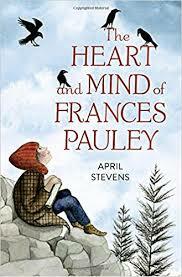 Stevens, April The Heart and Mind of Frances Pauley, 196 pages. Schwartz and Wade Books (Random House), 2018. Content: Language: G; Mature Content: PG; Violence: G.
Frances Pauley is an eleven year old who is quirky and loves nature. Frances’ teenage sister, Christina is embarrassed by Frances. Christina is going through an emotional roller coaster as a teen, with friend problems and she likes a boy. Christina’s behavior confuses Frances and Frances has her own hardships to deal with. This book is about family, friendship and being true to yourself. This is a coming of age novel that paints some of the painful truths about what it means to be the family member of an angst-y teen. There were some heartwarming moments and Frances is a likable character, but she’s not necessarily easy to relate to. It's a slow read and I'm unsure if many young readers will get into this book and it feels too young for the middle school crowd. 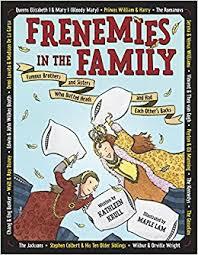 Krull, Kathleen Frenemies in the Family: Famous Brothers and Sisters Who Butted Headsand Had Each Other’s Backs, 220 pages. Illustrated by Maple Lam. NON-FICTION Crown (Random House), 2018. Content: Language: PG (1 swear); Mature Content: G; Violence: PG. Fifteen different siblings and their stories of bonding and rivalry are covered in the chapters of this fun read. Each family has a biography that concentrates on why they are famous and how as siblings they worked together or against each other. Some of the siblings discussed include Peyton and Eli Manning; the Wright brothers; the Disney brothers; the Romanovs; Queen Elizabeth and Bloody Mary and the Siamese Bunkers twins. I loved this book because it made me laugh and it was full of fascinating gossipy type facts. Each chapter has illustrations and a short comic strip that summarizes the story. It’s a fast read with entertaining stories throughout. EL, MS – ESSENTIAL. Reviewer, C. Peterson. 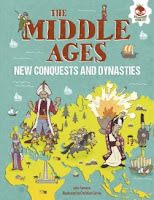 Farndon, John The Middle Ages: New Conquests and Dynasties, 32 pages. NON-FICTION. Hungry Tomato (Lerner), 2018. $20. 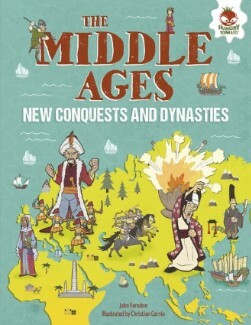 This book picks up from where the Rise of Civilization book leaves off –with the Middle Age and ends with the Age of Explorers in the 1500s. It touches on Knights and Castles, Vikings, and much more. Pages are presented as world map with facts and figures strewn throughout. If a student could get past the busy and unappealing cover and there were in interested in the middle ages –they would enjoy reading through all the tiny facts in this book. That being said, I think students would rather go for a DK middle ages book or one features a knight or Viking in action. I do like that this book touches on other parts of the world besides Europe and the achievements of those people. I have an entire shelf full of middle ages books, so I don’t think I would add this one. Farndon, John The Rise of Civilizations: First Cities and Empires, 32 pages. NON-FICTION. Hungry Tomato (Lerner), 2018. $20. This short book is jam packed with information starting in the Stone age and moving forward until the Fall of Rome. Many of the pages are presented as world maps with lots of little fact blurbs about what was happening in that part of the world during that time period. Tiny depictions of people, buildings, tools, and more are pictured. This book really attempted to cover all the bases –there is just so much to cover. Condensed into 32 smaller than normal sized pages is ends up being just really busy and confusing. 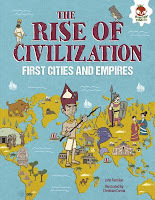 I don’t get many requests for a summary of civilization, readers are usually interested in a certain time period. Additionally, the cover isn’t very appealing –so I probably wouldn’t add to this my library. 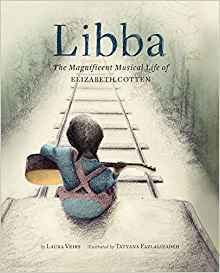 This nonfiction picture book tells of the extraordinary life of Elizabeth Cotten, a left-handed musical prodigy who grew up playing her guitar backwards and upside down. She became famous late in life through a combination of luck, talent, and pure hard work, and was best known for her song "Freight Train." Libba is a beautifully-illustrated biography that shows it's never too early to start on your dreams -- and never too late to fulfill them. Caden Bosch is sometimes a bright high school students and other times he is an artist on a ship heading for the Challenger Deep, the deepest part of the ocean. This is Caden’s journey through reality and hallucinations, and sometimes it is hard for him, and for the reader, to know the difference. This story follows Caden on a journey of discovery through his mind, through hallucinations and confusion. At times it is hard to separate reality from illusion. This story takes the reader on an often confusing journey through mental illness. It is so for the person who is suffering from mental illness and also for the people surrounding that person. Caden’s journey is full of misunderstandings, illusions and hallucinations. Caden tells his parents he joined the school track team when he really did not. He walks for hours and forgets to eat, losing a lot of weight. At the same time inside his mind he lives in a mixture of reality and hallucinations. I tried reading this book many times, but ended up putting it down. 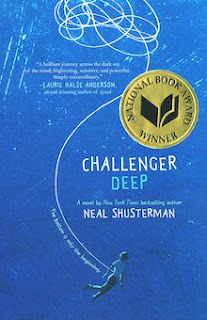 I read a lot of Neal Shusterman’s other books, and read about Neal Shusterman. I learned that his son suffers from mental illness. That knowledge changed my perspective. I read the book and could not put it down. I found it fascinating. It also gave me a better understanding of mental illness. All the illustrations in the book are done by his son, Brendan Shusterman. Edgar Kaufman hired Frank Lloyd Wright to build him a house by the stream called Bear Run in the woods of Pennsylvania. Wright was a world famous architect but as he got older he hadn’t built anything for a while, but he took on Kaufman’s request. Wright spent many months taking in the beautiful nature surrounding Bear Run and created the plans for a home that was built over the stream so you could hear the waterfall inside the home. After the home was completed it became another of Wright’s famous structures. The illustrations in this book are fantastic and the story is not well known among kids. 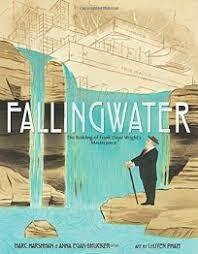 I think this is the type of book that makes the reader curious to find out more about what Frank Lloyd Wright has built as well as more about the house called Fallingwater. I'm not sure if kids would be interested in this story even though as an adult I find it fascinating. EL (K-3) – OPTIONAL. Reviewer, C. Peterson. Siegel, Mark also Alexis Siegel, Xanthe Bouma, Boya Sun and Matt Rockefeller The Sand Warrior, 250 pages. 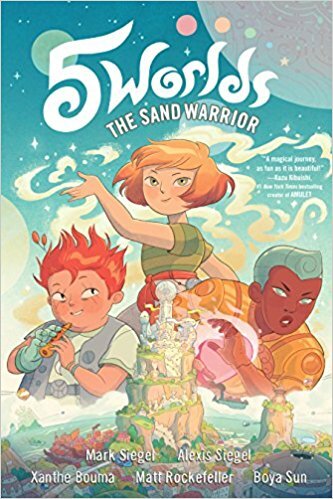 GRAPHIC NOVEL Random House, 2017 $13.00 Language: G (0 swears 0 “f”); Mature Content: G; Violence: G.
Oona Lee is training to be a sand dancer. Her older sister Jessa was chosen for the Beacon Lighting 7 years ago, but ran away. Some say she went mad! Oona overhears the elders at a special meeting and discovers that the Five Worlds are dying. Some say lighting the beacons will bring everything back, but they've been dark for 1000 years. On the eve of Beacon Day, Oona receives a letter and a ticket from her sister. If Oona can bring her sister back, maybe she can light the beacons - but can she find Jess in time. "Oona! You're our last hope!" This is book one in the 5 Worlds series. Much of the story line is establishing the world, but there's an interesting plot and several great characters that will surely reappear in future worlds. It reminded me a lot of the Amulet books, so I'm sure this will be very popular with the middle school crowd. Kenney, Karen Latchana Who Invented the Television? : Sarnoff vs. Farnsworth, 32 pages. NON-FICTION Lerner Publications, 2018. $28. Content: G.
Farnsworth was a farm-boy from Idaho who came up with the idea of how to make television. 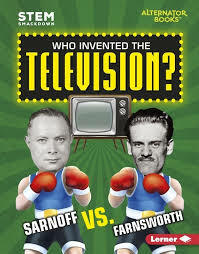 Sarnoff was a big business executive who tried to challenge Farnsworth and take away his rights to the TV. This book explains the back and forth that went between the two men and explains how the parts for the TV were conceived. Another fun read from the Stem Smackdown series that shows the backstory to the television-something most kids take for granted. It’s fun to read about a farm boy taking on a business executive because he believed in his idea, but it is also sad that Farnsworth had to waste his time battling Sarnoff instead of doing what he loved-inventing. The back includes a timeline, match up between the two men and a glossary. EL- ADVISABLE; MS – OPTIONAL. Reviewer, C. Peterson. Kenney, Karen Latchana Who Invented the Airplane? : Wright Brothers vs. Whitehead, 32 pages. NON-FICTION Lerner Publications, 2018. $28. Content: G.
This book looks at the beginnings of flight with the two major contributors being the Wright brothers and Gustave Whitehead. 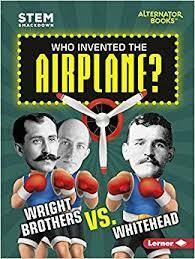 One chapter is a short biography on the Wright brothers, another chapter has Whiteheads story and then at the end it explains why there was a question about who flew first. At the back of the book it shows how they match up and a timeline. This book is a part of the series called Stem Smackdown and shows how inventors tried to beat each other to the final project. I enjoyed all of the information on the people as well as what adjustments were made to the planes/gliders to help them succeed. The pictures and captions also make it interesting and there is a lot of information for such a short book. This book is available in paperback for a much more affordable price. EL – ADVISABLE; MS - OPTIONAL. Reviewer, C. Peterson. 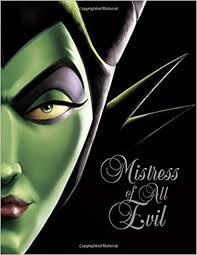 Valentino, Serena Mistress of All Evil (Villains, #4), 309 pages. Disney Press, 2017. $18. Content: Language: PG (7 swears); Mature Content: G: Violence: PG. This is a retelling of Maleficent’s character from Sleeping Beauty. From Maleficent’s childhood, she has been teased as being dark and not a fairy. A loving woman named Nanny found Maleficent and took her under her wing and raised her with love. When Maleficent’s anger is triggered during a fairy test, she unleashes harm on the fairy kingdom and is forever labeled evil. I’m not a huge fan of this Villains series because it feels like a bait and a switch trick-you read it because it has a villain that you love on the cover, but it really has more to do with a new set of characters. This book is mostly spent on the Nanny’s story and Circe, a witch whose three sisters are causing havoc all over the kingdoms. I think the covers are fabulous and a lot of kids will pick them up because of that. You have to read them in order otherwise they are confusing. EL, MS – OPTIONAL. Reviewer, C. Peterson. Valentino, Serena The Beast Within: A Tale of Beauty’s Prince (Villains, #2), 215 pages. Disney Press, 2014. $17. Content: Language: PG (3 swears); Mature Content: G; Violence: PG. The Prince reflects on his life before Beauty arrived when he was friends with Gaston and engaged to a girl named Circe. When the prince finds out from Gaston that Circe is a pig farmer’s daughter, the prince breaks off their engagement. Circe’s a witch and so are her sisters, so to punish the prince, Circe’s sisters put a curse on the prince that slowly turns him into a beast. 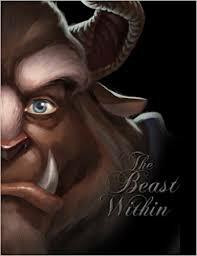 The beast tries to get another girl to fall in love with him, but his beastly ways start to take over. This is a closer look as to why the prince is turned into a beast. I felt like the three sisters were the villains and that the beast isn’t ever considered a villain, so it’s confusing what this book is doing in this series. My other disappointment with this book is that Beauty isn’t hardly in it at all, and the subtitle of the book implies that it will be about Beauty and the prince. I don’t like the three witches and this story was annoying. 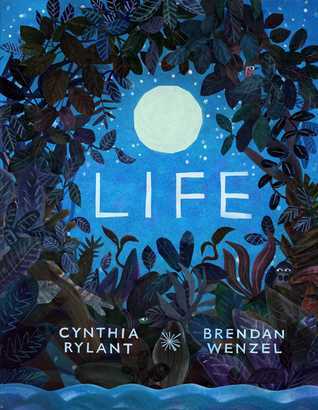 Life explores the good and bad of being alive, encouraging grit and gratitude among its readers. I must admit, this touching picture book brought tears to my eyes with its sweetness and its sense of hope, and appreciation, and love for life. The words are simple, but the meaning is strong, and the illustrations are gorgeous. I could especially see using this one as an opener to discussing grit, gratitude, or having a growth mindset. 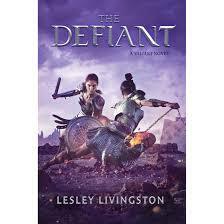 Livingston, Lesley The Defiant (The Valiant, #2), 371 pages. Razorbill (Penguin), 2018. $18. Content: Language: PG-13 (26 swears); Mature Content: PG-13 (passionate kissing); Violence: PG-13. Fallon is the beloved gladiatrix (a woman gladiator) for Caesar, which paints a target on her back for those warriors she has defeated to reach the top. When Fallon’s safe haven, Ludus Achilea, is invaded and her sister is taken by the competing gladiatrices and their leader Pontius, Fallon is captured by the enemy. An old friend shows up to help Fallon and her fighting spirit refuses to let Pontius and his dark group of senators take away her friends and her freedom. Fallon is a strong and likable character. This book had its slow moments, like second books in a trilogy seem to do, but it was still entertaining and had some good twists. The violence is when the warriors are fighting and they are bloody as well as a cannibalistic act is refereed to. MS, HS – ADVISABLE. Reviewer, C. Peterson. Livingston, Lesley The Valiant (The Valiant, #1), 372 pages. Razorbill (Penguin), 2017. $18. Language: PG-13 (16 swears); Violence: PG-13; Mature Content: PG (kissing). Fallon is a princess warrior who is in love with her best friend, Mael. When Mael proposes to her, she asks him to wait because she wants to join her tribe’s war band first, but her father, the Celtic King, announces her proposal to Mael’s brother instead of allowing her to be in the war band. Mael is mad at his brother, Adrien, because Adrien knew that Mael loved Fallon, so he draws Adrien into a fight, where Mael is killed. Fallon chases Adrien after the fight, but is then snatched by Roman slavers, and she finds herself on a slave ship bound for Rome under the slave master, Cai. This book is action packed. I love Fallon’s strength and she is a fun character to follow. 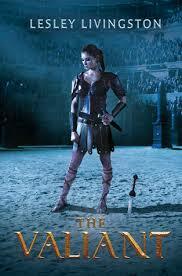 The time period of gladiators in Rome is interesting and well done with a cool twist of having female gladiators. The violence is sword fighting, be-headings, and an especially grotesque cannibalistic act. This is the first in what appears to be a three book series, but the ending is satisfying in its own way. 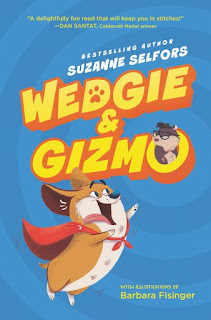 Selfors, Suzanne Wedgie and Gizmo, 166 pages. HarperCollins, 2017. $13. Language: (0 swears, 0 “f”) Mature Content: G Violence: G.
Wedgie is a dog and Gizmo is a guinea pig and they are part of a recently blended family. Wedgie believes it is his job to guard and protect the family, but the new boy, Elliot doesn't seem to like him. Gizmo belongs to Elliot, but his cage was damaged in the move, so he is currently living in a modified Barbie house (until a new cage can be acquired). Gizmo sees himself as an evil genius, but a late night house exploration results in a trip to the vet when Gizmo eats too much. Now, there's trouble between the siblings - blending a family is hard. Told in alternating chapters from the pets point of view, this delightful story - which includes snippets of dialogue so the reader gets the family's perspective as well - is hilarious! I love the voice of the pets, Gizmo calls Elliott his human servant. An easy read, accessible by those transitioning to longer chapter books, but clever enough for the older elementary student to also appreciate. 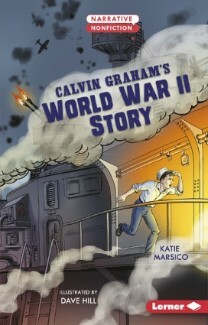 This is the short biography of Calvin Graham, who is so intrigued by War War II that he joins up at the age of 12 by pretending he is 17. He ends up on the USS South Dakota which is heavily bombed by the Japanese. He proves his bravery and compassion and is awarded as hero (for a while –until his mom spoils things). 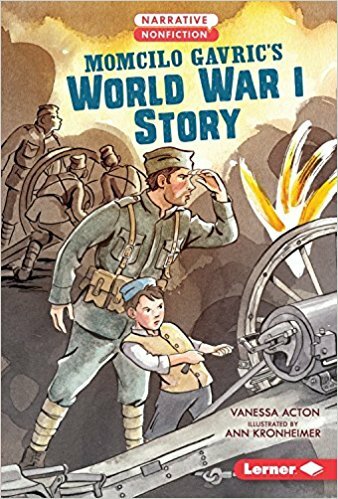 This is a short story and presented almost in an easy chapter book format, as if for 1st or 2nd graders, who do often ask for war and battle books –so this could be an option for them. The content is this book is a bit harsh (death and injury) as compared to the other one in the series that I reviewed. Contain lots of illustrations and actual photographs and a timeline at the end. Upper grade teachers presenting these wars to their class, could use this as a quick opening story to introduce a unit. Action, Vanessa Momcilo Gavric’s World War I Story, 32 pages. NON-FICTION. Lerner, 2018. $20. This the short biography of Momcilo Gavric. It’s the middle of World War I and his home in Serbia is destroyed by the Austro-Hungarian Army. He is upset and sad but even as an 8 year old, he ran to find the Serbian troops to lead them to his village for revenge. They let him stay in the army and his mentored and taken care of. His is the youngest soldier to fight in World War I. This is a short story and presented almost in an easy chapter book format, as if for 1st or 2nd graders, who do often ask for war and battle books –so this could be an option for them. The content is not too harsh, though some of the big details about the who’s and why’s would be over their heads. Contain lots of illustrations and actual photographs and a timeline at the end. Upper grade teachers presenting these wars to their class, could use this as a quick opening story to introduce a unit. George, Jessica Day The Rose Legacy, 260 pages. Bloomsbury, 2018. $17. Content: Language: G; Mature Content: G; Violence: PG. Anthea has been moved from relative to relative ever since she was orphaned, until she is invited by a distant uncle to come and live with him. Anthea is hesitant to live with this uncle because he lives on the other side of the Wall and Anthea has been raised to think only outlaws live on the other side. When Anthea gets to her uncle's, she is further perplexed because he also owns forbidden horses. 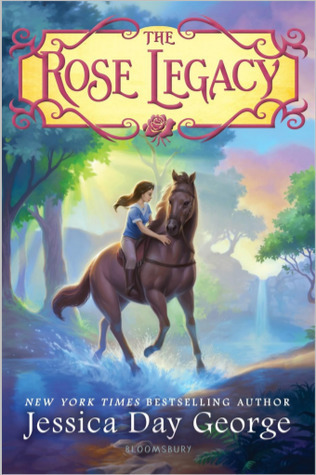 Anthea seems to have a deep bond with one of the powerful stallions and starts to realize that there are many mysteries surrounding her life. I loved this story because Anthea is a strong character who is easy to empathize with. The minor characters are also amusing and the plot moves along at a quick and interesting pace. I imagine there will be more in this series because the ending left a few bigger questions open. 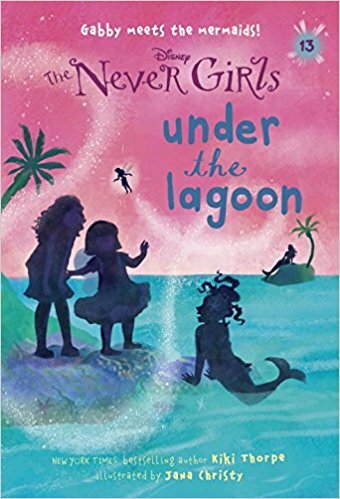 Thorpe, Kiki Under the Lagoon (The Nevergirls #13), 112 pages. Random House, 2016. $6. Language: G (o swears); Mature Content: G; Violence: G.
Gabby, the youngest of the Never Girls, wants to meet a mermaid. But its quite apparent they are not friendly. One day when she is allowed off alone to look for sea glass, she meets a younger mermaid, just her same age. They strike up a secret friendship. When a pixie spies them playing, she tells everyone. Quickly the fun gets exaggerated into danger, and everyone is worried. This is a really fun series, but I am pretty much over reviewing books in it. In the school library I rarely have series read past book one or two (with a few exceptions like magic treehouse –but even then –they don’t read them in order). This book is fun, high quality, and has a lot of heart –I like the lesson about accepting others and overcoming prejudice. Add this to your library if this series is popular, if not –invest in books 1-3 and see how it goes. This is about a boy named Michael who finds out that not everyone has the same access to enough food that he does. He decides he wants to help and has an idea for a food drive, and leads the charge at his school. Features large color illustrations. 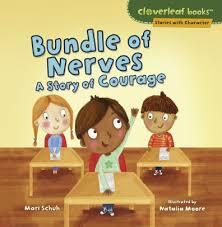 I like this book because its proactive –a student see’s a problem and finds a way to solve it. But not all schools can do food drives –some of the schools are the ones that need food drives done for them. 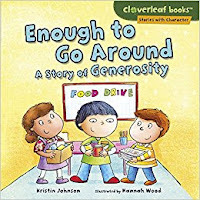 If your school does an annual food drive, this would be a great way to introduce the concept to younger grades. I would have preferred a more generic book about everyday ways to show generosity. This is the story Luis, he is starting school for the first day. He is nervous, but gradually learns to overcome his fear by using some advice from his dad about having courage. Lots of little situations are shown that illustrate ways to be courageous. This would be a fantastic book for a teacher to read to a class about courage –students could brainstorm examples of ways they have been courageous in the past and things they are nervous about for the future. It is a great way for students to learn to identify an emotion then learn ways to cope with it. Large illustrations would be easy to share with a K-1st grade group. This is a short picture book story about a boy named Ben who is still learning how to be respectful at school: waiting his turn and not interrupting. It’s also about a boy name Pete who learns it’s respectful to include everyone. Large and bright illustrations. This is a fantastic book for a Kindergarten or first grade teacher to read to a class. 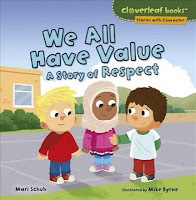 Its simple to understand, easy to share with a group, and would be easy to refer back to when students need reminding of how to be respectful. Alice dates, both guys and girls, but that’s not her problem. Her problem is that she is asexual. She wants a relationship, but she doesn’t want it to be sexual. Finding a person who will accept her is nearly impossible. 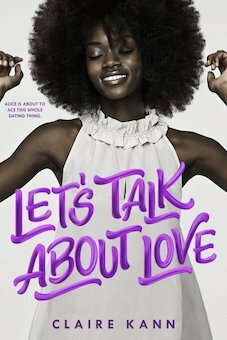 After her girlfriend can’t handle it any longer and breaks up, Alice is ready to swear off dating forever. Then she meets Takumi. She falls in love with him, but she is not sexually attracted. This may be one more relationship for the garbage heap or he might finally be the one who accepts her the way she is. In the meantime, she must figure out a way to convince her parents that being a lawyer is not the career she wants. This is a story about a college student who just wants the freedom to figure out her life and be accepted as she is. She doesn’t want to be pressured to be the person other people want her to be. In many ways, this is a sweet love story. Takumi is a perfect gentleman to Alice. In addition to the sexual component, there is also the issue of inter-racial relationships, but this is a minor mention in the story. I expect this book to be popular with teens who like realistic fiction about sexual identity and finding your path. 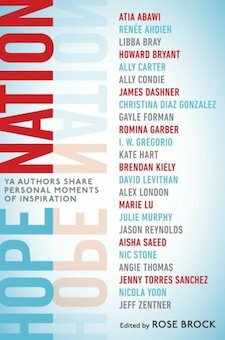 This is a compilation of expositions by well-known YA authors about hope and what it means to each of them. Most of them are inspired by family or the current political and cultural climate. Authors from all racial backgrounds comment on their own experiences with immigration, racism, politics, nationality, success, difficult decisions, and the people who influenced their lives. This compilation is an attempt to encourage today’s youth not to despair about the challenges they face in the world today because through hope, they will be inspired to find solutions. I found this to be an awkward book. Although I found several essays to be uplifting, most of them rehashed the negativity in the world and ended with a hope for something different. I wanted to see examples of challenges that had an actual positive outcome, not a hope for something that might or might not happen. Some authors chose to give an abstract rambling that resembled an assignment to define hope. I don’t know any teens who would select this as reading material.